We love Aerial Photography, the high vantage point is really something that is hard to do if you don’t go very high. The one thing that all those tutorials have in common is that they require some sort of technical ability. The easiest one, getting your camera on a painters poll, require slight carpentry skills, but getting your camera on a helli or a plane gets kinda techie. 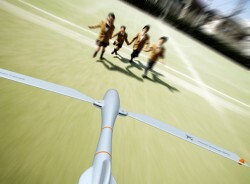 If the tech stuff was holding you back from aerial photography, designer Xiaofei Wang has some great news for you. 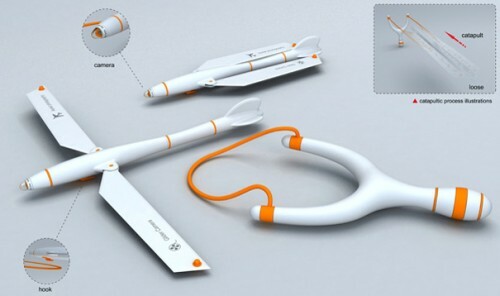 A camera Xiaofei Wang designed is built into an airplane slingshot. 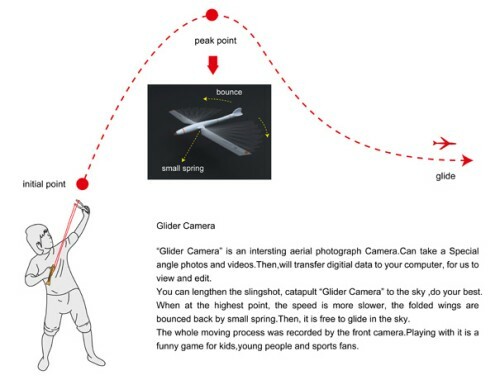 The camera is housed at the tip of a glider plane which you can sling. At first the plane’s wings are folded so it can get high, and then when it reaches top height, the wings fold back for a smooth photographed glide down. I wonder if a similar camera can be DIYed from a Glider and a Keychain Camera.